The first look from my real-life holiday capsule wardrobe is one of the more casual options. This could be worn to Thanksgiving, to a work party right after being at the office, a dinner party at a neighbor's house. 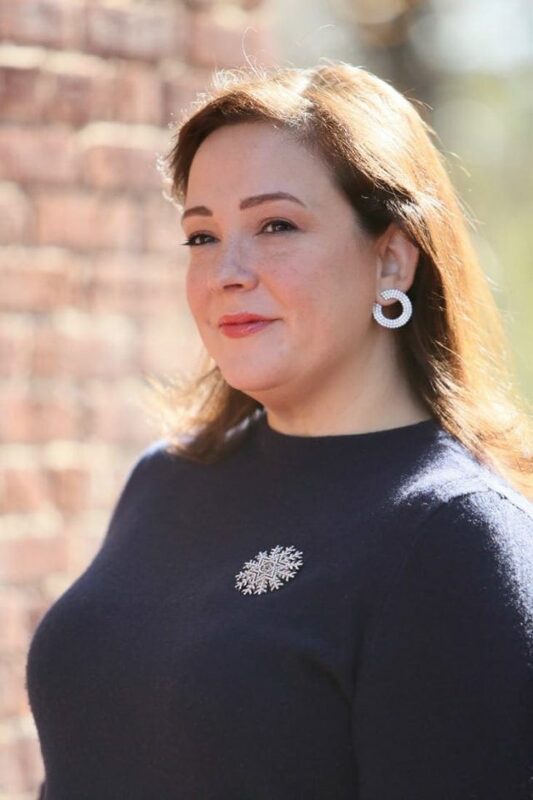 To make it more festive I swapped out the traditional brooch for one shaped like a snowflake. If red lips are too bold for you, my favorite trick to soften the look is apply a lip balm or gloss first, then the lipstick. Here, I used Fenty Gloss Bomb before I applied L'Oreal's Matte-Traction Red (my favorite red lipstick). I've even used good old Carmex before red lipstick to soften the look. 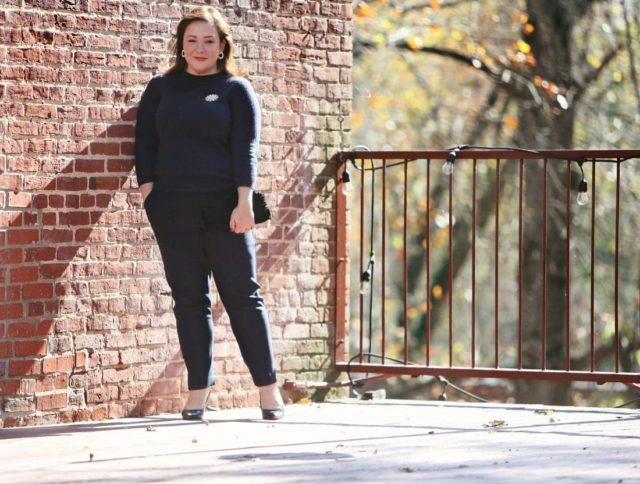 Yes, you can mix navy with black. 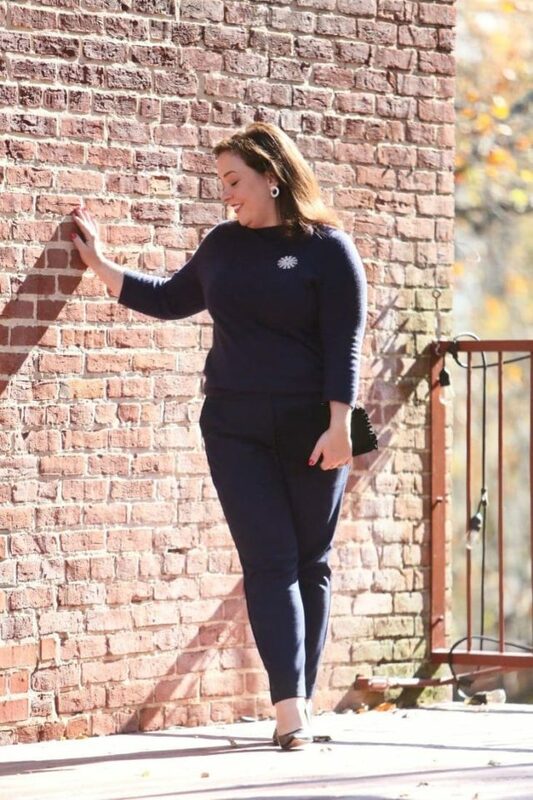 Matching navy with navy from a different brand is near impossible. Black is an appropriate neutral and doesn't take away from the outfit. If you wished to dress this look up more, switch out a closed-toe pump for a heeled sandal, or add a pair of shoe clips to your pumps or flats. 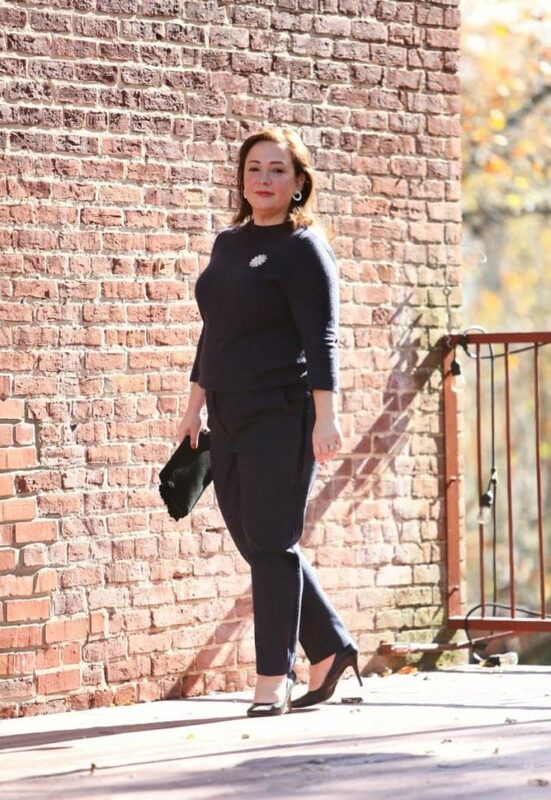 What makes the pants of this navy cocktail pantsuit special is the velvet tuxedo stripe down the side. This subtle detail elevates the pants from office to cocktail party (here's the link to the matching blazer). To see all the pieces from my real-life holiday capsule wardrobe visit this blog post. And stay tuned as I will be featuring outfit posts throughout November that are taken from this capsule wardrobe. Huge fan of the black/navy or ink combo. Love the detail of the side stripe on the pant. I like leopard print shoes with my navy/black outfits too. I love that combination as well! This outfit looks wonderful on you and really showcases the results of the commitment you’ve made to working out! Bravo! The brooch is just the right holiday touch, I’d never think to look for something like this on Amazon! That’s a marvelous look on you. 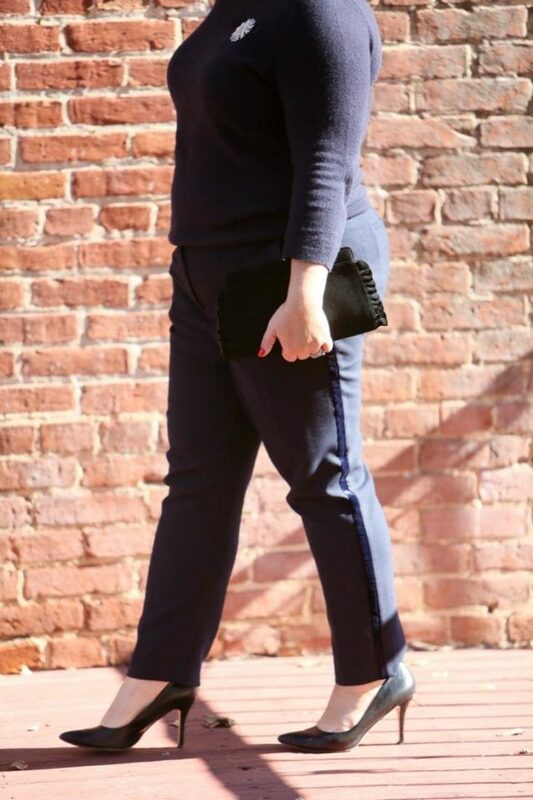 I am a late-in-life convert to navy and I love it! Me too, I didn’t like it in the past because it seemed too hard to match. But now I am quite a fan!